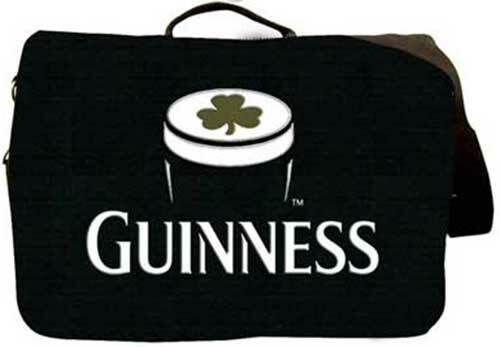 The Guinness messenger bag is a classic black design that features an embroidered pint with a green shamrock. The Guinness courier bag is equipped with a shoulder strap and metal buckles along with a zippered compartment and heavy cotton construction. The Guinness messenger bag measures 14" wide x 12" tall and it is received with a shamrock history card, complements of The Irish Gift House.